Ideal for business, school and personal dictation, PC/Mac-compatible voice recorder makes recording easy. 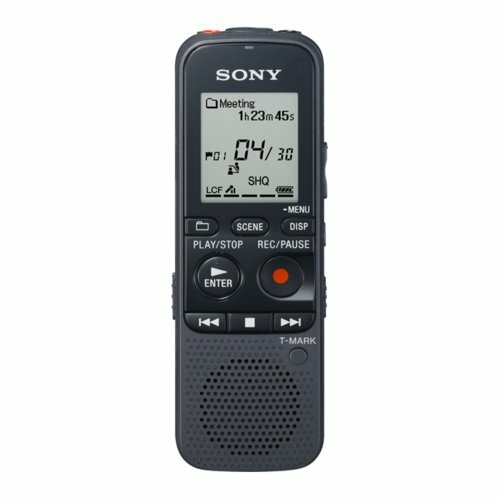 With up to 1,073 hours of recording time (LP mode) from the built-in 4GB flash memory plus Micro SD expansion slot for more recording space, you'll never miss a class or those random thoughts or ideas. The built-in memory card slot (microSD/M2) provides additional recording time via removable flash memory and can be used to transfer files quickly and easily to a computer with the supplied USB cable. Voice-operated recording starts and stops automatically with your voice. The A-B repeat function marks the beginning and ending of a particular recorded passage for repeated playback. Using Scene Select, you can select a pre-determined recording mode with the push of a button so the recorder will automatically will optimize the settings for recording notes, lectures, music and more. Track Mark lets you find the exact spot in your recording in a snap. Recorder runs on two AAA batteries.